Once upon a time a lion lived with his wife lioness in a dense forest. They gave birth to two cubs. The Lion asked the lioness to stay at home and take care of the cubs. One day, the lion could not find any animal to hunt. When returning back to home, he found a little fox on the way. The Lion took the little fox to their home and gave it as a gift to the lioness. The Lioness was very happy about the gift. She brought the fox kid with the same love as she showed to her cubs. The three little animals grew together. One day, when the three animals were playing together, they saw an elephant. 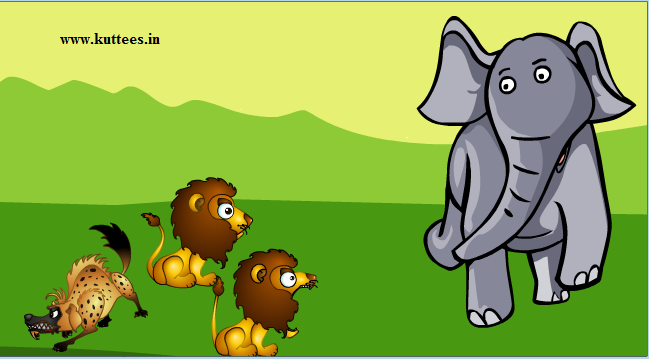 The two lions wanted to fight and hunt the animal, but the fox was frightened and asked even the lion cubs to run away. So they ran away from that place and back at their home, the two lion cubs told about what happened to their lion. Mother Lioness laughed at this and told the little fox that even though he was brought up like other lion kid, he was still a fox. She said foxes do not hunt elephants and this is why the little fox was not ready to fight with an elephant. The fox felt very bad about this and did not want to live anymore with the lions. He left their home to join his fox family. Moral: A coward will always remain a coward even if it is in company of the brave.